This week’s BEACON Researchers at Work blog post is by University of Washington postdoc Sylvie Estrela. Conflict is widespread in nature and that is no exception in the microbial world. Examples of competitive interactions between microbes include competition for shared limiting nutrients, competition for space, and the production of compounds such as toxins and antibiotics that inhibit or kill competitors. In the face of such conflict, how can we explain the occurrence of mutually beneficial associations between unrelated organisms, known as mutualisms? Microbes are intrinsically leaky, that is, they produce a broad range of metabolites into their environment as a result of their metabolism. When these waste products of metabolism are used as nutrients for growth, this is called cross-feeding. Thus, a cross-feeder reaps some benefit from the association with a producer. If the waste product is toxic to the producer, then waste removal by the cross-feeder is beneficial to the producer. This can be seen as trading a service (detoxification) for a resource (food). At a first glance, it seems that both partners would benefit from the association, setting out the ground for mutualism to occur. To gain a better insight into the dynamics of this interaction, I started by developing a simple mathematical model. The model revealed that this simple cross-feeding interaction can generate a variety of possible ecological outcomes, spanning mutualism, exploitation, and competition. Furthermore, it highlighted the importance of the metabolic constraints of individual species and the features of their shared environment, such as toxicity level and decay rate of the waste product, in determining the conditions for mutualism . This was the beginning of my academic journey into exploring how mutualism may arise at the first place and be maintained, and which ended up being the main focus of my PhD research supervised by Dr. Sam Brown at the University of Edinburgh. At this point, the model described two species growing in a well-mixed (planktonic-like) environment. But in natural environments, most microbes live in surface-attached, spatially-structured communities such as biofilms. An interesting feature of growth in a structured environment is the stronger potential for demographic feedbacks between interacting partners. This is mostly due to the fact that an individual cell has a stronger effect (either positive or negative) on its neighbouring cells than on the cells that are further apart, which in turn feeds back on its own growth. So how do metabolic interactions and demographic feedbacks combine to shape the spatial organisation and functioning of polymicrobial communities? Figure 1. Simulation of a two species community where species are engaged in a food for detoxification metabolic interaction. 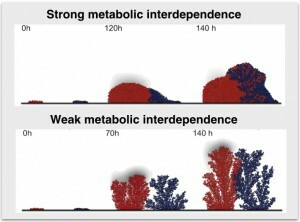 While strong metabolic interdependence drives species mixing, weak metabolic interdependence drives species segregation. To address this question, I used a spatially-explicit model that simulates the growth of the two-species community on a surface. I found that strong metabolic interdependence generates mutualism and species mixing, and community behaviour is less sensitive to variation in initial conditions (initial species frequency and spatial distribution). In contrast, weak metabolic interdependence generates competition and species segregation, and community behaviour is highly contingent on initial conditions (fig. 1, ). Hence, these findings suggest that demographic feedbacks between species are central to the community development, shaping whether and how potential metabolic interactions come to be strengthened or attenuated between expanding species . Now as a postdoc in Prof. Ben Kerr’s lab (UW), I’m interested in exploring further some of these questions by specifically focusing on the evolution of mutualisms and interdependencies when traits are costly to perform rather than just a waste product of metabolism. Because of the lack of relatedness between partners, evolutionary conflicts of interest will be strong. But despite conflict, interspecific mutualism can prevail when the conditions are such that partners’ interests are aligned and potential conflicts are kept in check. A critical question is how this can be achieved. In collaboration with Prof. Ben Kerr and Prof. Eric Klavins (UW), I’m using the ‘gro’ simulation platform to address this question (fig. 2). Figure 2. 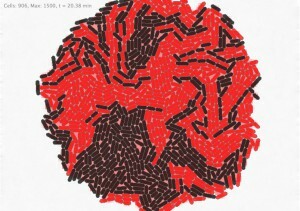 Snapshot of a ‘gro’ simulation showing the emergent spatial pattern of two species exchanging costly essential functions. 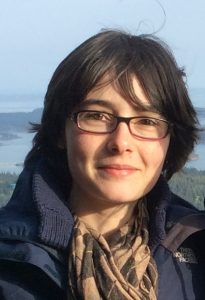 For more information about Sylvie’s work, you can contact her at sestrela at uw dot edu.